At Boat Bike Tours we run unique multi-day boat and bike tours that immerse you in authentic Dutch life and culture, including spectacular cycling trips through tulip fields. From the official season launch mid-January, to peak tulip season from mid-March to mid-May, there are so many ways to experience the beauty of the tulip flower and its importance in Dutch culture. Every January, on Nationale Tulpendag, tulip season kicks off in the heart of Amsterdam with a vast display of more than 200,000 flowering bulbs. Visitors can wander through the display and pick tulips to take home – for free! This one-day preview is very popular and queues build throughout the day, so arrive early! When it comes to tulip mania, the most popular destination is probably Keukenhof: a historic castle and garden that becomes a sea of color in spring. The expansive gardens include artistically-curated flower beds, international gardens, exhibitions, and a maze, petting farm and more for kids. 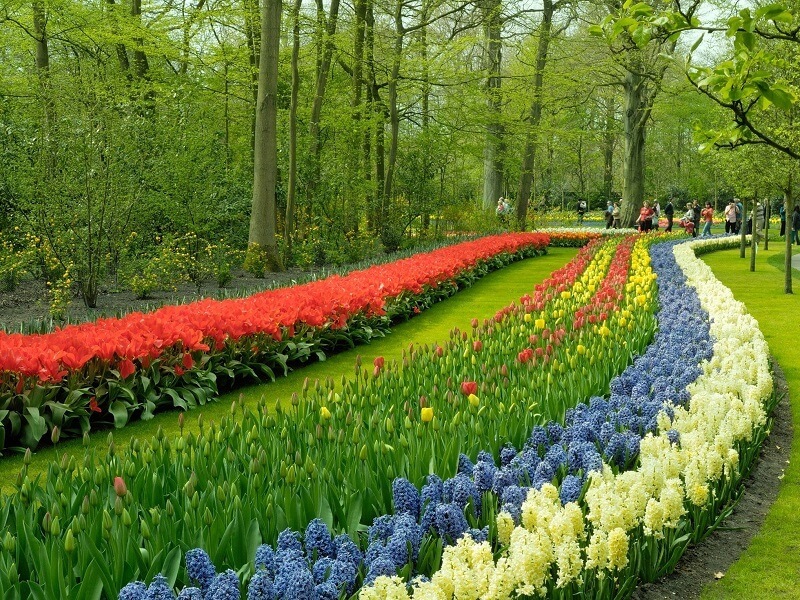 Keukenhof is about an hour’s drive from Amsterdam. During tulip season the gardens are at their busiest so arrange your ticket and transport in advance! One of the most authentic ways to experience the Netherlands’ iconic flower is to cycle through the landscape when it’s in full bloom. At Boat Bike Tours we offer a selection of springtime tulip-themed tours that not only immerse you in stunning floral scenery, but also take you by full-service overnight boat journey to see the best of Holland: from charming historic villages and cheese farms, to UNESCO-listed windmills and the splendor of Keukenhof. Peek behind the scenes of the Dutch flower industry at FloraHolland flower auction, the largest floral market in the world. In this massive complex, at Aalsmeer near Schiphol airport, you will see not only tulips, but all kinds of flowers, sold at auction to local and international buyers. You may not be able to view the flowers up close, or even buy them, but you do get a fascinating insight into the logistics and inner workings of the global flower trade. There are so many ways to enjoy tulip season in the Netherlands. However you like to travel, we hope you can also experience the power of this remarkable flower!